STEP Combustion also designs, engineers, and provides Selective Catalytic Reduction (SCR) systems which provide the highest level of NOx reduction. As its name implies, the SCR uses a catalyst and injected reagent such as ammonia or urea to convert NOx to elemental nitrogen (N2. The reagent is injected upstream of catalyst housing and mixes with the flue gas. The SCR system NOx reduction can be engineered based on the catalyst dimensions, catalyst materials, cell density, reagent injection, temperatures, etc. 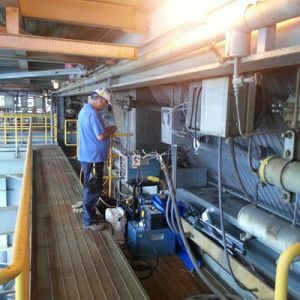 STEP provides SCR tuning and management services as well as complete systems including handling skids, injection equipment, catalyst, reactor housings, and ancillary equipment. We offer catalyst materials in several types, including homogenous honeycomb or corrugated catalyst, as well as plate-type catalyst. STEP selects catalyst material from one of several catalyst manufacturers based on the application requirements. This allows us to match catalyst to operating conditions, and flue gas constituents, while integrating our injection and control systems. STEP Combustion has several experienced field engineers providing technical support in the start-up and operation of the STEP SCR systems.